Due to their relatively large surface, dust and powder particles provide ideal conditions for igniting and triggering an explosion, regardless of whether flour, wood or coal dust is involved. In an emergency, it is therefore essential to effectively suppress and isolate the shock wave and combustion in order to mitigate the risk of an explosion propagating to other parts and leading to uncontrollable detonation. The reason behind this is that the shock wave of a dust explosion propagates at the speed of sound, which is approximately 330 meters per second, and the flame at approximately ten meters per second. 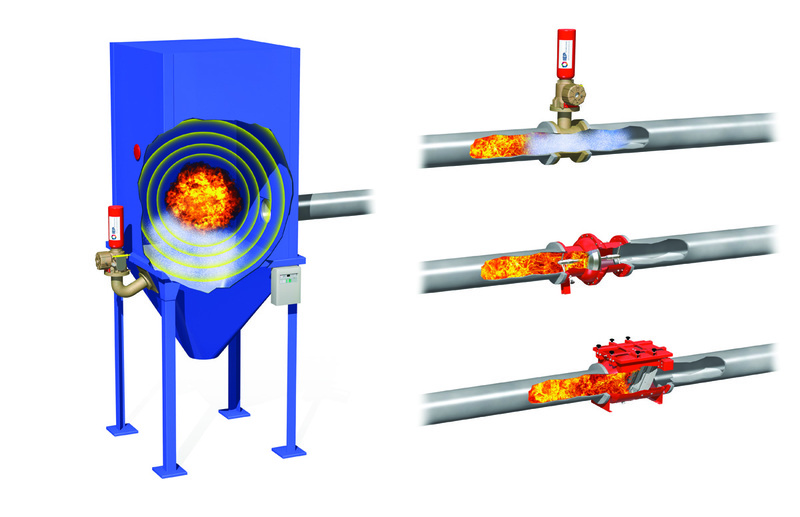 Effective suppression is successful when heat is withdrawn from the combustion zone, causing the temperature to drop below the minimum ignition point of the material. What specifically does successful explosion suppression involve? Efforts center around a concept that is both simple and efficient: Approximately twenty milliseconds after a spark has been ignited inside a plant, a sensor detects the incipient explosion based on a sudden rise in pressure. Suppressant is then automatically fed to the source of the explosion nearly instantly, spreads, and absorbs the heat, stopping the increase in pressure within approximately 75 milliseconds after ignition. As a result, the explosion is halted and suppressed, without causing major injury to employees or damage to equipment. IEP Technologies is a member of the HOERBIGER Group specialized in active and passive explosion protection of industrial plants. IEP Technologies industrial safety and explosion mitigation solutions save lives and protect equipment. The HOERBIGER Group is a global leader in the fields of compression technology, drive technology, and hydraulics. In 2016, its 6,800 employees achieved sales of 1.067 billion euros. The HOERBIGER brand is synonymous with components and services providing high customer value in compressors, industrial engines and turbines, automobile transmissions, and multifaceted mechanical engineering applications. The HOERBIGER Safety Solutions Segment offers comprehensive safety solutions for a wide range of industrial applications. The goal is to save lives, through integrated explosion protection. This is the declared purpose of the IEP Technologies and Newson Gale brands at HOERBIGER. IEP Technologies is the system and service specialist for the entire explosion protection process for dust and gas applications. Newson Gale brings with it know-how and decades of experience in the protection of plants against risks from electrostatic charges. This sounds amazing. A great breakthrough. This would solve many potentially very dangerous scenarios. For something to work this fast is amazing. Do you know if and when these will be installed?